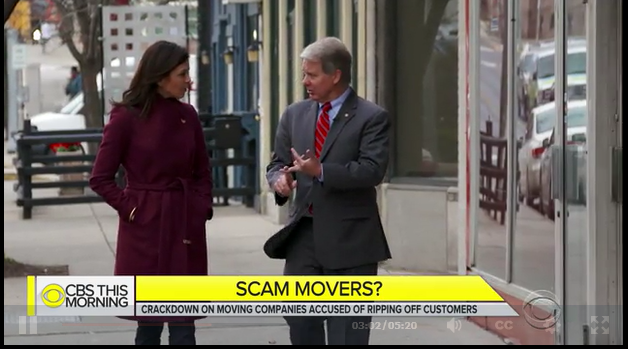 A bill that I introduced last session, which protects consumers against illegal household goods movers, received national attention this week in a special report on CBS This Morning. Many illegal movers pretend to be legitimate businesses but fail to get necessary insurance and permits or pay worker’s compensation or taxes, resulting in dangers to both consumers and employees of the unlawful business. Act 77 of 2017 strengthened penalties against rogue movers who pose as legitimate, licensed professionals. The CBS report detailed a situation in Florida that resulted in customers having items stolen, damaged, or held for ransom by unscrupulous movers. Under the law I authored, a rogue mover could face a fine of $5,000 for the first offense and $10,000 for second or subsequent offenses. Individuals may also have their vehicle registration suspended and vehicles confiscated and impounded. The law does not impact you if you lend a hand to a friend or neighbor when they are moving, just those who seek to defraud the consumer. Pennsylvania is leading the way in protecting consumers who could be impacted by the dishonest business practices detailed in this report. Illegal movers create a great deal of damage and suffering so it is encouraging to see this issue get the nationwide attention it deserves. This week the Governor held a brief ceremony in his capitol office to recognize a new law, Senate Bill 851, which I had introduced at the suggestion of several local constituents. This legislation was a bipartisan effort to hold negligent property owners, not the taxpayer, accountable for properties that are in the delinquent tax sale process. Senate Bill 851 amends the Real Estate Tax Sale Law to clarify ownership of these properties, many of which have code violations pending against them. The goal of this legislation was to correct the flaw that was made in a 2002 court decision and to place the burden of the costs where it belongs – on negligent property owners of severely blighted properties, not the taxpayer. AND YES, before hundreds of you ask: The Governor, as soon as he saw me, noted that we really need to address school property taxes this session, in a bipartisan manner. I agree 100 percent! This legislative session I have been appointed by Senate President Pro Tempore Joe Scarnati to serve on five standing committees in the Senate of Pennsylvania for the 2019-2020 legislative session. I will continue to serve on the Senate leadership team as Chair of the Senate Majority Policy Committee, and will also serve as Vice Chair of Urban Affairs and Housing and as a member of the following committees: Agriculture and Rural Affairs, Appropriations, Community and Economic and Development, and Finance. I am honored to represent the people of Berks and Schuylkill Counties on these committees. These assignments will be very valuable in assisting with the most pressing issues we face in East Central Pennsylvania. I look forward to using my position on these committees to pursue issues such as elimination of school property taxes, downtown revitalization, fighting welfare fraud, and cutting unnecessary spending in the state budget. The work accomplished by Senate committees helps set the agenda of the entire General Assembly. My goal will be to ensure the perspectives of this district are strongly represented as we debate some of the most important issues facing Pennsylvania. Pennsylvania Correctional Industries named General Industries Foreman Jason Strouse, who works in PCI’s laundry division at SCI Frackville, as PCI’s Employee of 4th Quarter 2018. Jason is a valuable asset to the laundry division and has become a reliable and trusted employee. PCI has benefitted from Jason’s cost- effective measures thanks to his efforts and abilities. Due to Jason’s educational background in mechanics he has had the opportunity to utilize those skills through fleet equipment upkeep and repairs as well as teaching back some of these skills to the inmates employed in our laundry division. The ability of the Pennsylvania Department of Military and Veterans Affairs (DMVA) to reach the state’s nearly 800,000 veterans and their families extends to every county across the commonwealth thanks to its two Mobile Veterans Outreach Vans. Both vans are wheelchair-accessible and staffed with accredited Veterans Service Officers. It’s a great resource for veterans to learn about federal, state, and county benefits available to them. These benefits may include connected disability compensation, pensions, VA health care benefits, burial benefits, education benefits, vocational rehabilitation, DMVA’s six long-term care facilities, and much more. In 2018, the vans traveled to 107 events across the state and DMVA staff interacted with more than 1,500 veterans! The outreach staff coordinates each event with county directors of veteran’s affairs, veteran service organizations and local and state officials to maximize publicity and attendance. To request a van for a community event and to find out where the vans will be, visit DMVA’s webpage and select the Mobile Veterans Outreach Vans link.